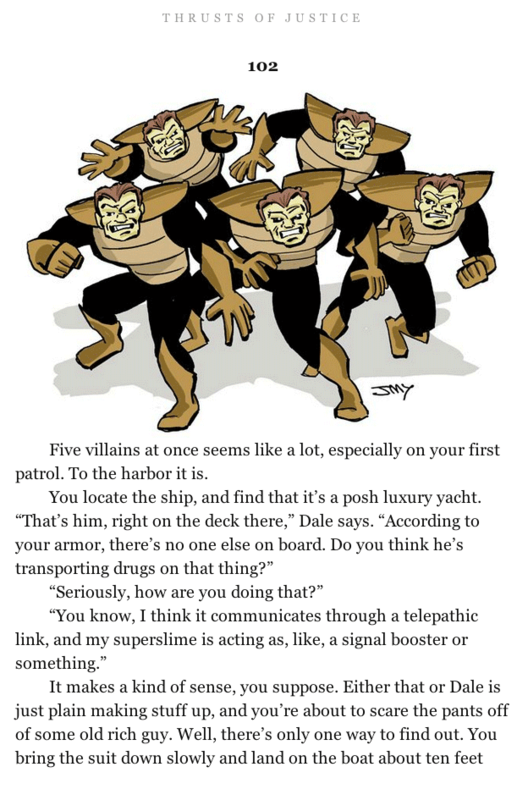 When last we left our Cosmic Guardian, we were considering which of two targets to take, a warehouse with five life forms or a yacht in the harbor with just one. Feeling muy macho, we opted for the warehouse, hoping it's five henchmen and not the Legion of Doom. Well. There you have it. I assume Dale was wiped up by the Green Handkerchief or something, a living slime mold's worst enemy. At least we didn't get eaten in this book, unlike Zombocalypse, so that's a bonus. In the finest super-hero comics tradition, however, I declare a reboot! That's right, there's a new editor in town, sales have slumped after the epic demise of our featured character, and we're in need of a hit. So we do what all creatively bankrupt companies do, we go back in time and pretend mistakes were never made. We're the New Coke of the Choose Your Own Adventure world, people! Boy, that lone figure in the harbor sure sounds interesting, doesn't it? I say we go check that out! The Savage Cockroach! I love it! We have GOT to leap into battle shouting "RAID!" I don't ask for much, universe, surely you have to give me this. "Wait, what's that I hear stomping nearer and nearer? It's your arch enemy, the Boot!" I hope our next big battle with him is at his secret lair, the Motel. OK, enough with the bug puns. Before we can squash his plans (that was the last one, I swear! ), we have to survive this unexpected melee. Looking at our options, I have to say that Dale so far has known a lot more about our suit than we do. And apparently the slime has some sort of connection as it can amplify the armor's thoughts, so the idea of merging isn't totally daft on the face of it. On the other hand, have you seen what slime does to computer parts? Not pretty. Let's just say neither my escaped snail collection nor my last computer enjoyed the meeting all that much. So what'll it be, and why? 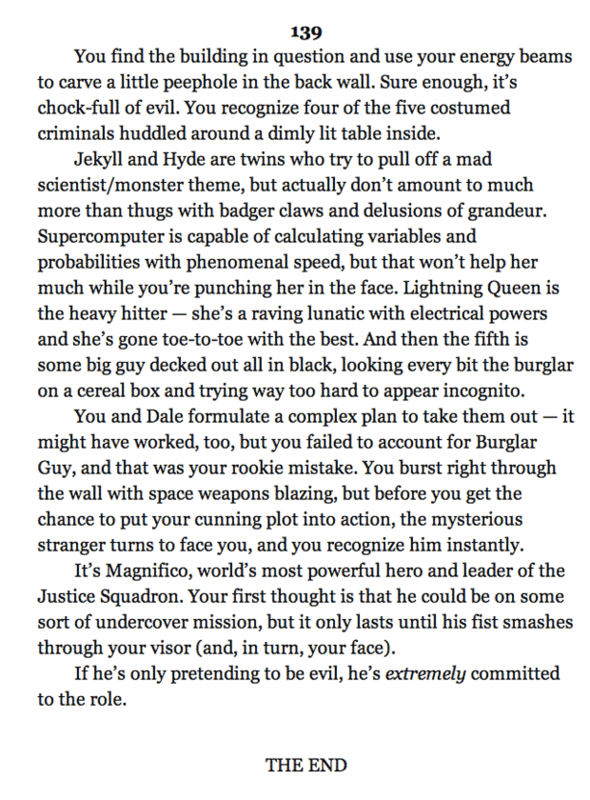 This entry was posted in RPG Corner, Thrusts of Justice. Bookmark the permalink. 16 Responses to Warehouse? There! There house! By our powers combined, we are…Slimeborg! It just sounds ridiculous enough that it might work in this kind of book. I guess I should have asked if people even want to continue. I just sort of made the call. Thoughts? Well, I’m game for popping in another quarter and hitting the start button during the continue countdown. Speaking of which, can anyone identify the movie the title of this post is referencing? Well, I for one think Dale is nuts. But then I was pretty keen on the warehouse idea and look where that got us. So I voted to join. The good news is, we now know that Magnifico is secretly Evil Burglar Guy, so if we meet him again we can totally metagame it. I say keep going. (and I wanted to hit the boat in the first place. I told you so). Half of the fun in these things is trying over when you face your undeserved end. They are indescribably deadly on purpose to encourage replaying them. If you just give up whenever you die, your missing at least half the point. And while Dale is almost certainly a little crazy, his instincts seem to be good. Lets try it. Dang, Kelex, that was fast! Hmmmm, haven’t decided which way I’m going yet, but I just gotta say, “Dude, we’re not Voltron!” was AWESOME!! Brought back all kinds of cartoon memories from the 80’s. Man I loved that show (The lions version). EDIT: Frak that. I’m going the Voltron way! 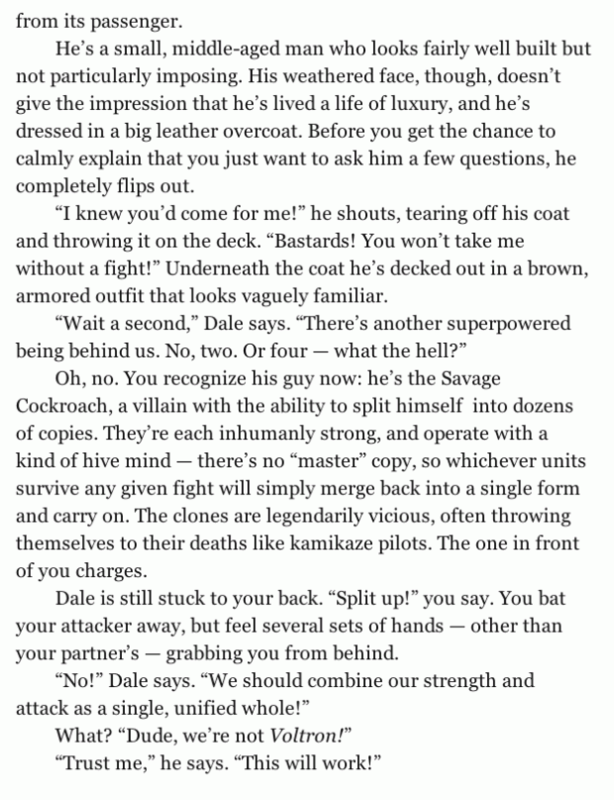 Dale: Wait, were you talking to me or your armor when you said that? Dale is certainly crazy, but he does seem to know his stuff when it comes to that armor. Let’s do it Voltron-style! And yes, of course we should keep going! See, we totally should have stuck around the bar to get hammered. Dale is drunker than us, and so far he’s the guy who can talk to our armor, and has actual ideas, so clearly alcohol is a help, not a hindrance. But since that ship has sailed, let’s just keep listening to him. What’s the worst that could happen? Reading these passages is actually a bit odd for me, as there was someone in my Explorer Scouts unit called Dale. Now I keep picturing this Dale as looking like the long-haired ginger I know.